Does MPC Touch require a computer to use? How large is the built-in touchscreen? What is the resolution of the built-in touchscreen? Will the included MPC Software work with my MPC Studio or MPC Renaissance? What is the recording resolution for the audio interface? Does MPC Touch require a power supply or is it USB bus powered? What software is included with MPC Touch? How many times can I install/authorize the included software? There aren't any disks in the MPC touch box...where can I download my software? Can I adjust the brightness of the MPC Touch screen? Does the MPC Touch come with a stand? If the stand is made out of plastic, won't the MPC Touch wobble when I hit the pads? Why does the MPC Touch installer include a step called Configure Screen? Why do I need to install Display Drivers? I tried to install MPC Touch's version of the MPC Software over my previous version and received an error message about RTAS support. Will my MPC Touch work inside Pro Tools? Where can I find further support for this and other Akai Pro products? MPC Touch is not a standalone piece of hardware and does require a computer, but the built-in touchscreen allows you to take advantage of all your favorite MPC features quickly and easily right on the hardware. The built-in touchscreen is 7". The touchscreen resolution is 1280x800. Yes! MPC Software v1.9 is fully functional for the MPC Touch, Studio, and Renaissance. The MPC Touch records 44.1 kHz 24 bit. MPC Touch includes a power supply which is required for the product to function fully. 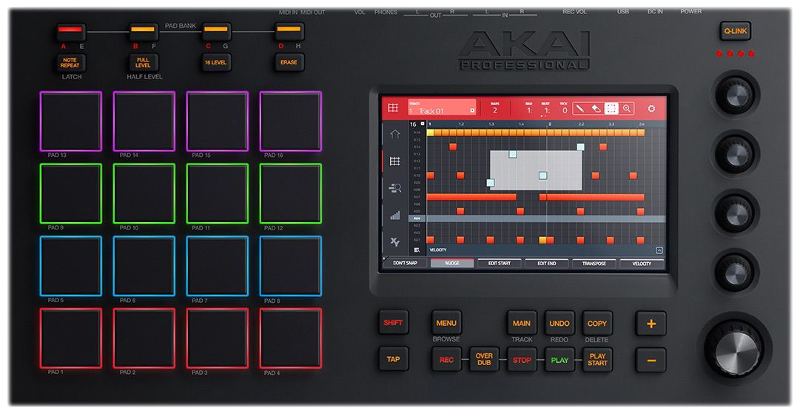 Without the power supply connected, MPC Touch will still send data from the pads and controls to the MPC software via USB, but the built-in touchscreen will not power on. The MPC software can be authorized on up to 4 computers simultaneously. This includes the sample content, The Bank and The 809. The AIR plugins can be authorized on up to two computers simultaneously or an iLok. Authorizations can be moved if necessary. For more information, see our Managing AIR Licenses article here or contact our Tech Support team for further assistance. After you purchase an MPC Touch, visit www.akaipro.com/mpcdownload to register your product and download the included software and sounds. You sure can! Brightness controls are on the right side-panel. Yes it does! The MPC Touch includes a plastic stand that you can lock into the bottom of the unit. This allows you to view and perform at an angle. The optional stand raises the MPC Touch enough to provide a desirable angle for viewing the screen and performing on the pads. It's low enough and wide enough that the hardware won't bounce around at all during play. The stand also has rubber feet on the bottom to improve stability. As long as your MPC Touch is resting on a solid service, it won't bounce or slide around. The built-in touchscreen is actually set up as another display monitor for your computer. While the MPC Software is running on your computer, MPC Touch will display the software's touch interface. If the MPC Software is not running, you have the option to either turn the display off entirely, or use it as a desktop extension. Additionally, while running the MPC Software, you can switch between viewing the touch interface or your extended display on the built-in touchscreen by holding SHIFT and pressing ERASE on the MPC Touch. As of MPC Software v1.9, the RTAS plugin format is no longer supported. While you'll have absolutely no problem opening the MPC Software as a plugin inside Pro Tools 11 or 12, Pro Tools 10 and below are NOT supported.